Damnum means = Damage in the sense of money, Loss of comfort , service , health etc. Injuria means = Infringement of a legal right / injury to legal right. 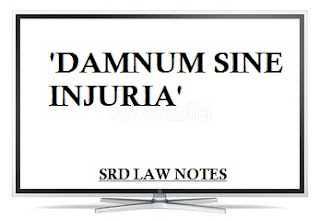 Damnun sine injuria means damages , monetary loss, to the plaintiff without violation of legal right, not actionable because no injury to legal right. 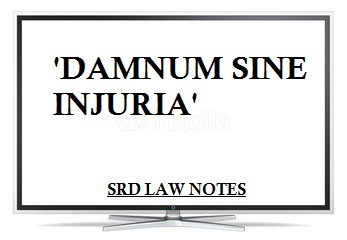 In Simple words, Damnum sine injuria means damage without infringement of any legal right. damage without injury is not actionable. Mere loss of money's worth does not of itself constitute legal damage. There are many acts which though harmful are not wrongful in the eyes of law, therefore do not give rise to a right of action in favour of the person who sustains the harm. No one is to be considered a wrong doer who merely avails himself of his legal rights, though his action may result in damage to another. Corporation of Bradford was supplying water from its well. Defendant was having adjacent land to the corporation land wherein there was well. Defendant was willing to sell his land. He approached the mayor of corporation. Negotiations failed. Defendant dug well in his own land .thereby cutting the underground supply of water of corporation well this has caused a loss to corporation because there was no adequate supply of water to the people of corporation. Plaintiff sued Deft for damages for malice. Deft.is not liable, because defendant's act is not wrongful as not violated legal right or plaintiff. There is factual malice, ill will digging well in his own land does not amount to tort. Defendant was school teacher in plaintiff's school. Because of some dispute Deft left plaintiff's school and started his own school. As defendant was very famous amongst students or his teaching,boys from plaintiffs school left and joined to Deft.School . Plaintiff sued Deft.for monetary loss caused. Deft not liable. Compensation is no ground of action even though monetary loss in caused if no legal right is violated of anybody. Plaintiff was running a mill on his own land, and for this purpose he was using the water of the stream for a long time. The Deft dug well in his own land and thereby cut off the underground water supply of stream. Through percolation the water gathered in the well of deft. The quantity of water of stream was reduced and the mill was closed for non availability of water. Plaintiff sued deft for damage. Deft. Not liable, because of principle of Damnum sine injuria. No violation of legal right, though actual loss in money. poor explanation and not 100% correct. www.marshallgeisserlaw.com/ This article gives the light in which we can watch the truth. This is exceptionally decent one and gives indepth data. A debt of gratitude is in order for this decent article.